Live Oak, California—Speeding on a tireless rim in search of medical help for his passenger who was injured when his vehicle crashed, an intoxicated driver continued down Highway 17 until a second collision finally stopped him. Hannah Milkowski, age 26 from Arizona, and Kristofor “Kris” Benson, age 38 of Scotts Valley, California were headed to the beach for a day of surfing on June 4th. According to the California Highway Patrol, Mr. Benson crashed his Range Rover into a power pole near Morgan’s Run in Scotts Valley. Ms. Milkowski struck her head on the windshield. Rather than calling for emergency medical assistance, Mr. Benson continued south on Highway 17 in search of a medical facility. 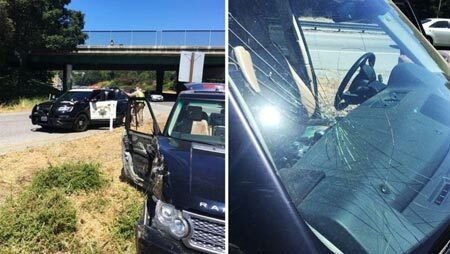 He exited Highway 17 at the Soquel Drive ramp, stopping only after crashing his heavily damaged Range Rover a second time. Emergency medical personnel pulled Ms. Milkowski from the back seat and administered CPR. She was air evacuated to Santa Clara Valley Medical Center in San Jose. She died a week later after life support was removed. Benson suffered minor injuries. Benson was arrested and jailed on suspicion of DUI. He was released after posting bail. Benson then fled when three felony charges were filed on June 9th. An arrest warrant has been issued for gross vehicular manslaughter while intoxicated. We extend our condolences to the family and friends of Ms. Milkowski over this tragic loss.